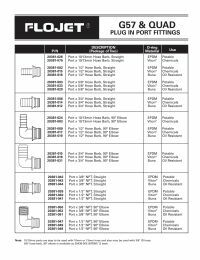 Flojet 20381-042 Quad Plug In Port Fittings for pumps with a 3/4" port opening that accepts Quick Disconnect (QD) style O-ringed fittings including Aquajet, Aquatec 550 Series, Jabsco (3XXX0), FloJet (04XXX) and ShurFlo. Typical port openings include a Sliding Clip to secure fittings in port. The quick connect port system makes hose removal very easy and allows fast winterizing and system draining. Quad Port Fittings are manufactured with an EPDM Oring. Buna-N O-Rings and Viton O-Rings are available upon request.